A splendid choice for the High Holidays or any other special time of the year, this natural yemenite shofar looks and sounds marvelous. 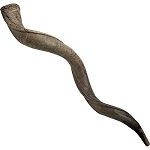 It's a 100% Kosher Yemenite Shofar that we offer to you at a terrific price. Size: 101-106 cm / 40-42 inch.